Coomassie staining subsequently to SDS-PAGE separation of human TPO1 ABIN934730. 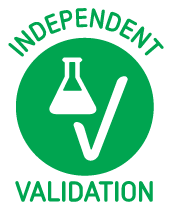 Read validation report #102795 for application SDS-PAGE. Standard curve and ABIN934730 measurements using LIA. 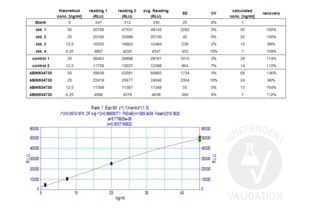 Read validation report #103249 for application Lipid Interaction Assay. Passed. 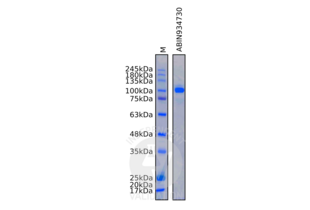 Recombinant human TPO protein ABIN934730 appears as a band with a molecular weight of approximately 100kDa after separation on an SDS-PAGE gel. Dilute 2µg of recombinant TPO (antibodies-online, ABIN934730, lot A13062501) in 2x sample buffer (126mM Tris-HCl pH6.8, 20% glycerol, 4% SDS, 0.02% bromophenol blue, 0.1M DTT). Boil samples for 5min at 95°C. Separate the sample on a denaturing SERVAGel TG PRiME 12% precast gel (Serva, 43266, V170144) in a Electrophoresis chamber (Hoefer Inc., SE250) with Laemmli buffer for 1h at 250V, 50mA/gel along side 4µl Roti-Mark Tricolor (Carl Roth, 8271, lot 326248051) molecular weight marker. Staining of the separated proteins with InstantBlue Protein Stain (Expedeon, ISB1L, lot 170616330) according to the manufacturer’s recommendations. Image acquisition: 600dpi scan and increasing of color saturation. The manufacturer’s information concerning the protein’s purity and molecular weight can be confirmed. Passed. Protein concentration of recombinant human TPO protein ABIN934730 can be confirmed by absorbance at 280nm and by LIA. Pipette 300µl tracer and 200µl standards, controls, or samples per tube in duplicates. Add 1ml washing solution to each coated tube prior to decanting off the liquid. Add 1 ml washing solution to each coated tube three times and decant off the liquid. Turn the tubes upside down for 5–10min and adsorb remaining liquid with blotting paper. Measurement in a luminometer by automatic injection of LIA reagents (sodium hydrate, azotic acid). Measurement time: 1sec. Calculate the concentration based on the standard curve. The LIA measures human TPO in serum, plasma and other fluids, using one anti-TPO antibody at solid phase and another anti-TPO antibody as tracer. The measurement range is from 10 to 50ng/ml. 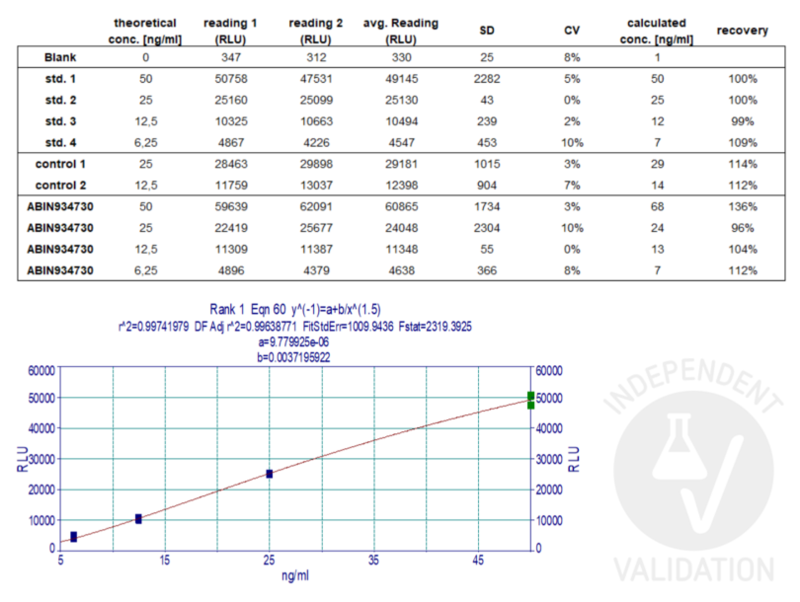 Absorbance at 280nm was 0.22. The calculated concentration considering the extinction coefficient is 0.6mg/ml (expected was 0.5mg/ml). Regression of TPO LIA standard curve was R2=0.997. Calculated concentration of LIA controls was 28ng/ml (expected 20-30ng/ml) and 14ng/ml (expected 10-15ng/ml). The calculated concentration of the diluted samples was 24ng/ml (expected 25ng/ml) and 13ng/ml (expected 12.5ng/ml). The other dilutions were out of measurement range. Background Thyroid peroxidase or thyroperoxidase (TPO) is an enzyme expressed mainly in the thyroid that liberates iodine for addition onto tyrosine residues on thyroglobulin for the production of thyroxine (T4) or triiodothyronine (T3), thyroid hormones. In humans, thyroperoxidase is encoded by the TPO gene. Application Notes Each Investigator should determine their own optimal working dilution for specific applications. Buffer Supplied as a frozen liquid in 40 mM TRIS HCl buffer, pH 7.6, containing 140 mM NaCl, 0.00 mM Kl and 20 % glycerol. Storage Comment Store below -60 °C.